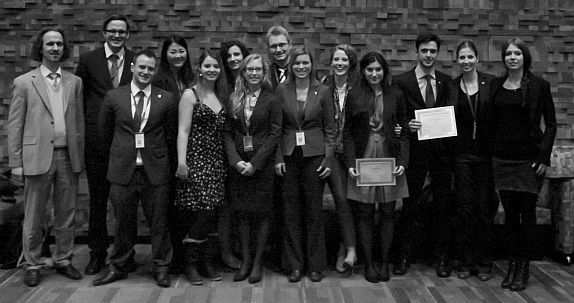 At WorldMUN 2012, the delegation of the University of Heidelberg proudly represented the Swiss Confederation at the Harvard World Model United Nations Conference held in Canada from 11-15 March 2012. After months of preparation, aiming to represent Switzerland as accurately as possible in each committee and including meeting up with the Swiss Consul Mr. Schweizer and an intense conference week in Vancouver, the Heidelberg delegation is now back in Germany. We brought home with us a grand total of 4 diplomacy awards, making Heidelberg the most succesful German Team during this year's 21st session of Harvard WorldMUN. Congratulations to Tatiana Kakara and Frederik Görtelmeyer (OECD) as well as Rima-Maria Rahal and Tobias Henz (ECOFIN) for their excellent work! as well as with potential future members of the delegation. 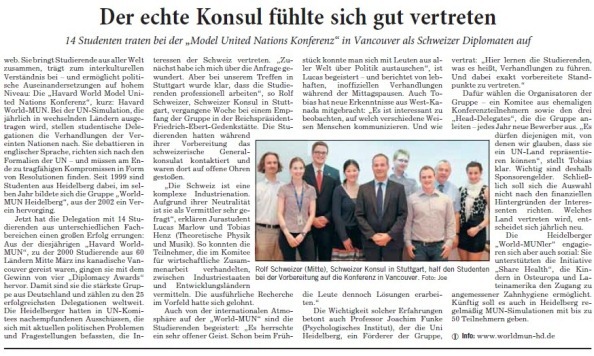 Please check out the corresponding article in the local newspaper (Rhein-Neckar-Zeitung).